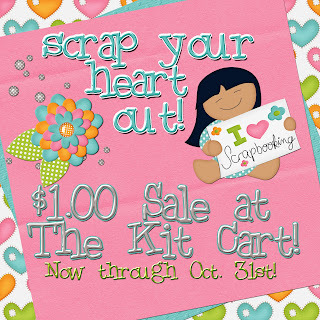 The Kit Cart: SCRAP WITH ME FREE KIT DAY 1 FREEBIE & SALE!! SCRAP WITH ME FREE KIT DAY 1 FREEBIE & SALE!! There is a big one dollar sale going on in the store! All kits, word art, quick pages and cluster frames are only $1.00 now through the end of the month!! Its that time of year to clean out the store a bit and this helps me see which kits sell the best. Also for freebies this week (well for the next 11 days) I'm giving a free kit away. 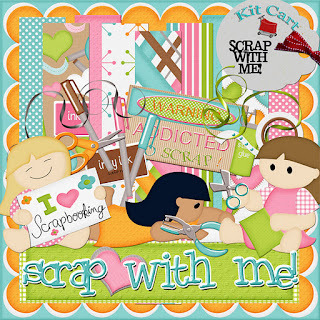 Scrap with me is a kit that every scrapper should have, so its my gift to you. Come back each day to get a piece of the kit. Once you've collected the whole thing you will have 136 Elements, 28 Papers and on the eleventh day I'll have the Alpha for you! CLICK THE IMAGE TO GET YOUR DAY 1 FREE DOWNLOAD!! SORRY LINK HAS EXPIRED!! thank you so much for part 1 of this awesome kit! Thank you so much for this post. I want to let you know that I posted a link to your blog in CBH Digital Scrapbooking Freebies, under the Page 5 post on Oct. 25, 2011. Thanks again. Oh I ♥ it! Thanks.